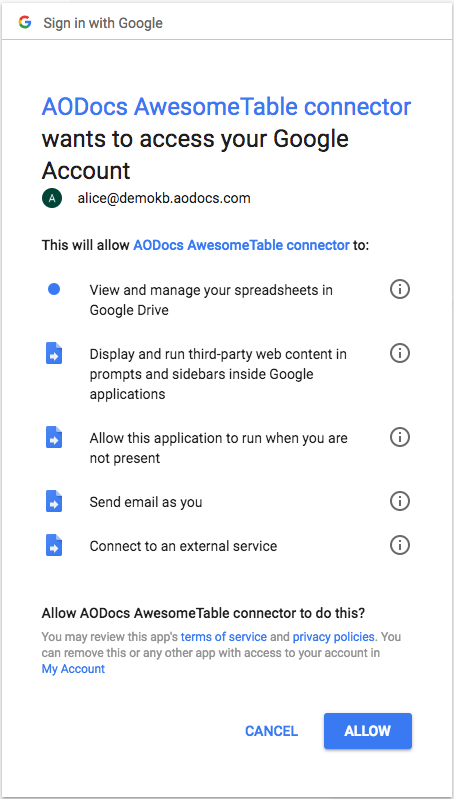 When end-users install the AODocs AwesomeTable connector, they are asked to grant some permissions on their G Suite account. When super administrators install the G Suite Marketplace app, they are asked to grant some permissions on their G Suite account. Display and run third-party web content in the prompts and sidebars inside Google applications Allows the add-on to reach the AwesomeTable Application Programming Interface (API) and create the AwesomeTable. What ist he maximum number of records you can export through Awsometable ? Normally the limitation is the limit of spreadsheet cells (2 million cells), but lately we had an incident where the number of exported records stopped between 9K and 50K records. Our engineering team is working on it. How does Auto-Refresh work? Refreshing every hour?